At Charlevoix Hospital, we’ve responded to the need for cancer care close to home with visiting oncologists, clinical oncology specialists, and a beautiful six-chair chemotherapy and infusion center. Floor to ceiling windows overlook the peaceful, healing waters of Lake Michigan. Patients receive treatment while relaxing in comfortable heated chairs equipped with massage settings. We even provide each patient with binoculars to watch freighters and sailboats slide across the horizon. 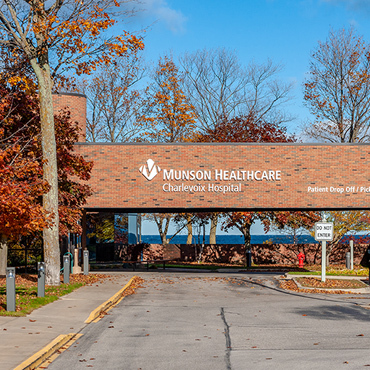 As part of the Munson Healthcare Regional Cancer Network, our pharmacy and laboratory services follow the highest standards, and every specialist on your care team employs the same protocols. So you get standardized, expert care close to home. Our team includes an oncologist, an advanced practice oncology nurse, certified oncology nurses, physical therapy, occupational therapy, social work, financial navigation, nutritional/dietary support, palliative care, and speech therapy specialists. Board-certified medical oncologist/hematologist Andrew J. Riddle, DO, meets patients in Charlevoix for consultations, evaluations, treatment planning, surveillance, and follow-up care. Dr. Riddle sees patients at the Charlevoix Surgeons office at 14695 Park Ave. in Charlevoix, directly across from the hospital. As part of the Munson Healthcare oncology team, Dr. Riddle participates in weekly tumor boards with Michigan Medicine subspecialists to present cases for additional review or for inclusion in clinical trials. While we provide many cancer services locally, advanced diagnostics and radiation therapies are delivered in Traverse City at the Cowell Family Cancer Center. We can help you get there with free transportation.